Although usually it is described as small but mighty, the Fügen resort is one of the treasures of Austrian Alps. It is a tourism hub and excellent place to spend your ski holidays with your whole family. A well-known fact is that Fügen is the place from where ‘’Silent Night, Holy Night’’, the famous Christmas song, started to spread all over the world. If you are considering Fügen as the perfect place for your ski trip, be sure to check Alps2Alps offer as the best transfer provider. The resort itself has opened 44 years ago and is quite popular amongst winter sports lovers. Fügen offers many pistes for different ski levels, there is a variety of snow and terrain parks for snowboards. 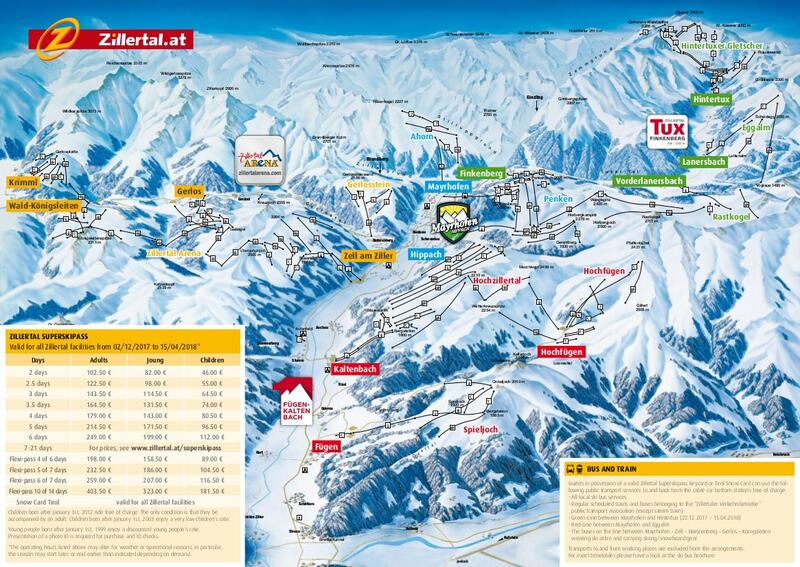 The resort is located It is a part of Zillertal Ski Area. The area offers plenty of apres-ski and nightlife for every taste. Also, local museum definitely is a must visit, if you want to learn more about local culture and lifestyle. There is train stopping at Jenbach village, which is very close to Fugen. It is served by Ziller Valley Railway - http://www.zillertalbahn.at. Traveling to Fügen from your chosen airport can be made easy if you choose Alps2Alps as your transfer provider. We take a dynamic approach to our pricing structure, as our main goal is to provide the lowest possible price together with best transfer service. Transfer to Fügen during the off-season and off-peak means huge savings - remember that if you choose your transfer in midweek (Monday-Friday) the prices can be up to 60% lower than weekend prices! The final transfer price to Fügen will also be influenced by vehicle utilization and vehicle availability, transfer schedule and other costs for example airport parking charges and road tolls. In order to discuss any specific needs of your trip to Fügen or your plans to travel as a larger group, please get in touch with us directly so we can discuss this. Fügen also offers racing courses, snowboard fun parks and tobogganing. Snow cover is reliable as you ski above 2000 meters. The resort is a part of Zillertal ski area, therefore with the right ski Lift Pass, you can access a total of almost 500km of downhill skiing! The Fügen ski resort has special offers for kids, youth and families. Local ski school is highly rated amongst resorts visitors. The resort offers plenty of apres-ski activities, although the village itself is rather small. You always have a chance to visit other ski resorts in the ski area with the proper ski Lift Pass. Booking your transfer to Fügen as soon as possible will help you to avoid missing out on the best offers. Get in touch with us at Alps2Alps and let us know your travel plans to Fügen - you can be sure that we will take care of the rest.